One of the problems people probably face these days is the breaking of objects that fall to the floor or the damage that small electronic devices get when they bump into hard objects. This is where elastic nanotubes can come into play. There has been a lot of research going on into what nanotubes can be used for, whether these be coiled or straight ones. One of the notable uses that seems to be making itself known to researchers is the use of elastic nanotubes as a cushioning device for small objects and for electronic devices. Since carbon nanotubes are considered elastic, regardless of their being straight or coiled, they are then considered to be ideal materials for use as cushioning for certain products and for use in certain applications. Researchers are working at finding out just how elastic nanotubes can be and when this is determined, how this elasticity can affect the overall elastic properties of the products that are produced with the use of these composites composed with the use of carbon nanotubes. The testing process that is used by researchers when it came to the determining of the strengths and elasticity of these elastic nanotubes when made into composite nanotube products that are aimed at building things that can be used for cushioning purposes involves the use of different nanotube compositions and one force-constant prototype. Elastic nanotubes that are used in these tests are often investigated for why they may or may not be as elastic enough for what they might be used on. This may include the perusal of structural details like helicity, number of walls, and radius. One such product of this kind of research, the coiled carbon nanotubes, can be considered one of the more elastic nanotubes around since they do present people with the kind of protection that elasticity often provides. These coiled carbon nanotubes are now being considered for use as cushions or buffers from impact due to the cushioning properties that they possess. These nanotubes have been tested with the use of controlled environments and with comparisons to other similar nanotube compositions, some of which are made not with coiled nanotubes but with straight ones. The results showed that the coiled nanotubes showed more promise for cushioning items than the straight nanotubes that were made in generally the same fashion. While research into these elastic nanotubes show some promise, particularly when it comes to the coiled carbon nanotube, more research is still needed before these products can be produced in huge quantities that can be utilized for commercial purposes. Some of the ideas that are being considered as ideal for use with these elastic nanotubes include surface cushioning for small mobile devices, cushioning applications for shoes and protective clothing, and even cushioning uses for bumpers and other car parts. The need for more research is needed to help establish that these nanotubes can indeed be manufactured to be strong enough for a lot of applications that go beyond cushioning small devices like mobile phones and portable electronics or the offering of comfort for your feet in shoe-cushioning applications. 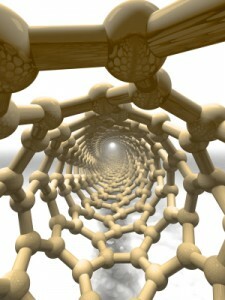 This entry was posted on April 5, 2010, 10:28 am and is filed under nanotubes. You can follow any responses to this entry through RSS 2.0. You can leave a response, or trackback from your own site.